This miniature Oak Color Playstuf Nursery set includes 5 nursery pieces. Included in the Miniature Playstuf Nursery Set are a crib, two mattresses (pink and blue), a changing table and a high chair. All pieces are 1:12 scale miniatures. 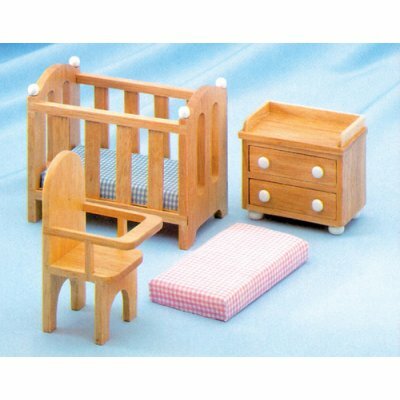 This Playstuf Nursery - Oak 5pc is supplied by Mary's Dollhouse Miniatures, which generally ships within 1 business day(s) of you placing your order . Mary's Miniatures is a family owned business located in Woodbine, GA. We buy, stock, sell and even create fine dollhouse miniature furniture, accessories and collectable miniatures. We currently off over 16,000 dollhouse miniatures in our online catalog. Mary's Miniature's items ship next business day.